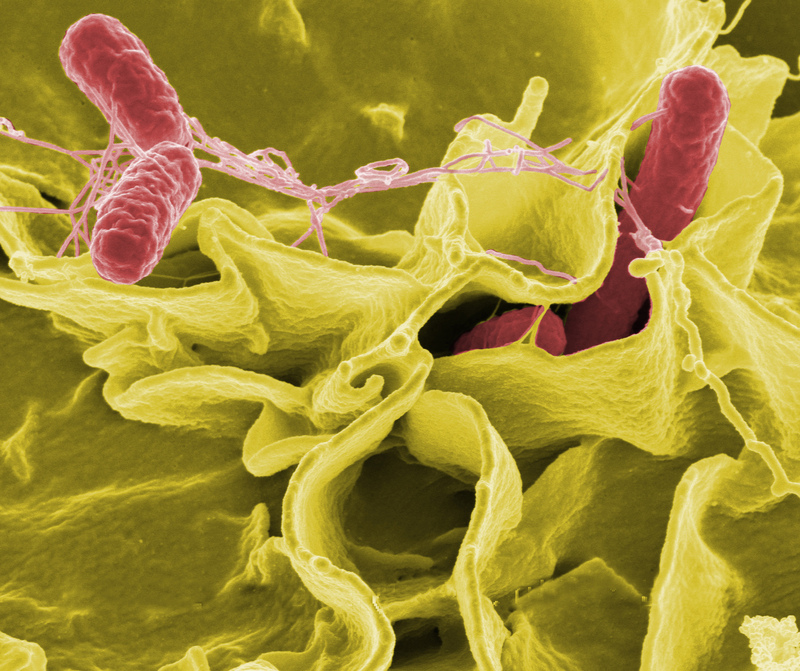 Salmonella, apart from being a bacterium that causes food-borne zoonoses in humans, is one of the responsible for infectious toxic avian hepatitis. According to a study carried out in China in 2008 with samples from birds in incubators, farms and slaughterhouses, there are multiple strains resistant to doxycycline (see Figure 1, source: ). The percentage of S. enteritidis resistant strains is lower than in S. indiana (56.9% and 97.85%, respectively). No significant differences were observed in microorganisms obtained from different sources (farm, incubators or slaughterhouse). Streptococcus species cause opportunistic infections in birds. Signs vary by species, but common presentations include septicemia, peritonitis, salpingitis, and endocarditis. There is a high prevalence of resistance to doxycycline in strains of S. gallolyticus obtained from birds, even in healthy birds, probably due to the administration of this antibiotic to animals that do not show signs of disease (see Figure 2) . It is responsible for necrotic enteritis, one of the most important enteric diseases in broilers. It has demonstrated high levels of resistance to doxycycline (98%) in broiler isolates . It is the cause of a very important poultry disease that is one of the main causes of disease, mortality and economic losses in poultry farms. Also in porciculture causes severe diarrhea after weaning and in newborn piglets. The susceptibility of E. coli to doxycycline depends highly on the strain. The results of various studies of prevalence of resistance in E. coli isolated in birds vary widely: 70.12% ; 58.3% ; 16.98% ; so it is necessary to perform an antibiogram prior to administration of the antibiotic (see graph 3). On the other hand, doxycycline has been able to eradicate an outbreak of colisepticemia in a broiler farm . It is the causative agent of swine dysentery, a disease of great importance in the whole world. 80.9% of the isolates in pigs showed intermediate sensitivity to B. hyodysenteriae in samples obtained from clinical cases in Sweden . These data corroborate the results of a study conducted in Poland, where a prevalence of intermediate-resistance sensitivity of 90.5% was observed . Graph 4. Distribution of the minimum inhibitory concentration (MIC) of different species of Brachyspira (Mirajkar, Davies, and Gebhart 2016). In contrast, in microorganisms isolated from laying hens no resistance to doxycycline was observed . Multiple strains of Salmonella enteritidis and S. indiana obtained from birds demonstrate a high prevalence of resistance to doxycycline, the percentage of resistant microorganisms varies according to the serogroup. The prevalence of resistance to doxycycline, even in healthy birds, is high. Despite this, the sensitivity in S. gallolyticus isolated from healthy mammals is high. The percentage of C. perfringens of avian origin resistant to doxycycline is high. The percentage of E. coli resistant to doxycycline varied widely depending on the strain. Variation of efficacy according to the species of Brachyspira hyodysenteriae: high percentages of resistance are observed in B. hyodysenteriae of porcine origin, while those of poultry origin prove to be susceptible. Doxycycline is an effective antibiotic against a wide variety of infectious agents, whether gram-positive, gram-negative, aerobic or parasite. The efficacy of this compound on bacteria and mycoplasmas of animal origin is high, as demonstrated against Mycoplasma spp., Brucella and P. multocida. Despite this, the presence of resistance in different microorganisms (Salmonella, S. gallolyticus, Clostridium, E. coli and Brachyspira) has been observed, depending on the serogroup, strain and species of origin, so it is advisable to perform an antibiogram prior to the administration of the treatment. Y. Lu et al., “Prevalence of antimicrobial resistance among Salmonella isolates from chicken in China,” Foodborne Pathog Dis, vol. 8, no. 1, pp. 45–53, 2011. R. Nomoto, L. H. Thuy Tien, T. Sekizaki, and R. Osawa, “Antimicrobial susceptibility of Streptococcus gallolyticus isolated from humans and animals,” Jpn. J. Infect. Dis., vol. 66, no. 4, pp. 334–336, 2013. K. M. Osman and M. Elhariri, “Antibiotic resistance of Clostridium perfringens isolates from broiler chickens in Egypt,” Rev. sci. tech. Off. int. Epiz, vol. 32, no. 3, pp. 841–850, 2013. T. Zhang, C. G. Wang, J. C. Lv, R. S. Wang, and X. H. Zhong, “Survey on tetracycline resistance and antibiotic-resistant genotype of avian Escherichia coli in North China.,” Poult. Sci., vol. 91, no. 11, pp. 2774–7, 2012. C. G. Wang, J. C. Lv, and T. Zhang, “Detection of resistance phenotype and genotype of avian Escherichia coli in Hebei Province,” pp. 2326–2332, 2009. H. Momtaz, E. Rahimi, and S. Moshkelani, “Molecular detection of antimicrobial resistance genes in E. Coli isolated from slaughtered commercial chickens in Iran,” Vet. Med. (Praha)., vol. 57, no. 4, pp. 193–197, 2012. R. T. Cristina, I. Schmerold, E. Dumitrescu, L. Cristian, S. Petrovici, and A. Netotea, “Study of Doxicycline Efficacy in Broilers ’ Colibacilosis,” Anim. Sci. Biotechnol., vol. 43, no. 1, pp. 469–73, 2010. M. Pringle, A. Landén, H. E. Unnerstad, B. Molander, and B. Bengtsson, “Antimicrobial susceptibility of porcine Brachyspira hyodysenteriae and Brachyspira pilosicoli isolated in Sweden between 1990 and 2010,” Acta Vet. Scand., vol. 54, no. 1, p. 54, 2012. J. Zmudzki, A. Szczotka, A. Nowak, H. Stzelecka, A. Grzesiak, and Z. Pejsak, “Antimicrobial susceptibility of brachyspira hyodysenteriae isolated from 21 Polish farms,” Polish Journat Vet. Sci., vol. 15, no. 2, pp. 259–265, 2012. N. S. Mirajkar, P. R. Davies, and C. J. Gebhart, “Antimicrobial susceptibility patterns of brachyspira species isolated from swine herds in the United States,” J. Clin. Microbiol., vol. 54, no. 8, pp. 2109–2119, 2016. D. S. Jansson and M. Pringle, “Antimicrobial susceptibility of Brachyspira spp. isolated from commercial laying hens and free-living wild mallards (Anas platyrhynchos).,” Avian Pathol., vol. 40, no. 4, pp. 387–93, 2011.